When mentioning to friends that I'd never heard the call of a Whip-poor-will, I'd get the reply more often than not: "Oh yes, I used to hear them but don't remember the last time I did". Last year when I wrote a blog post on the Montague Sandplains in Western Mass., I had heard about their presence there, but hadn't stayed late enough to actually hear one. I was determined to do so this year. 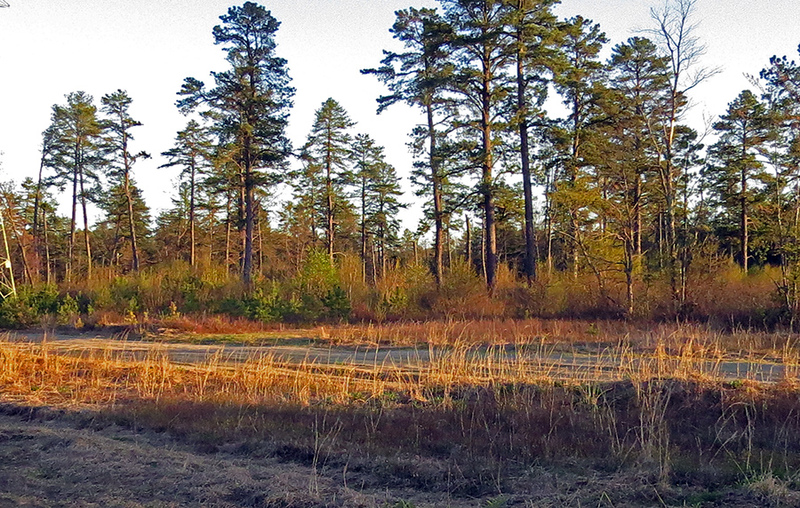 The Montague Sandplains is a 1500 acre pine barrens habitat of low shrubs, scrub oak and small pine stands, maintained with controlled burning, on a large sand delta formed by melting glaciers more than 10,000 years ago. I am including a map below for anyone interested in visiting the area. The species is shrouded in mystery. They are difficult to observe because of being active only at dawn and dusk, or on moon-lit nights. Because of this crepuscular behavior and their camouflaging plumage little is known about them. They are an edge species, requiring dry woodland for breeding and open spaces for foraging, just what the Montague Sandplains WMA is offering. When resting, they usually lie lengthwise on the limb of a tree and to the casual observer appear to be part of the tree. 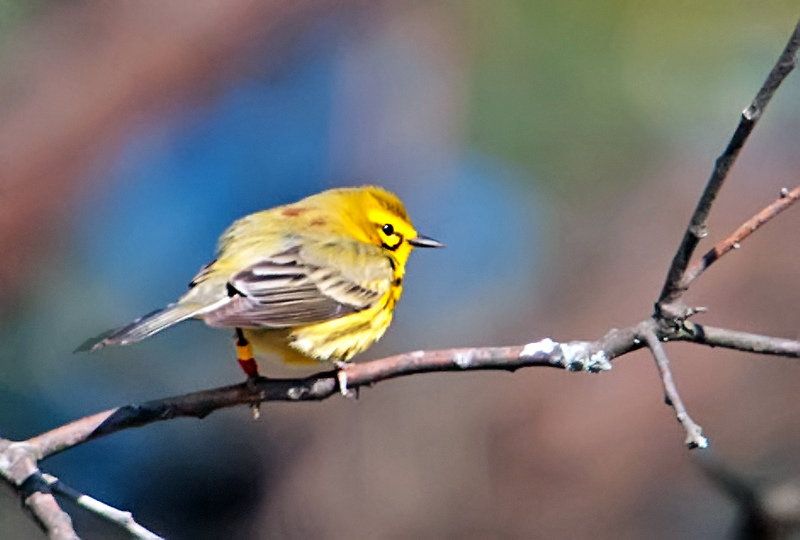 Males establish and defend their breeding territories by calling from their perches on trees, fence posts or the ground. 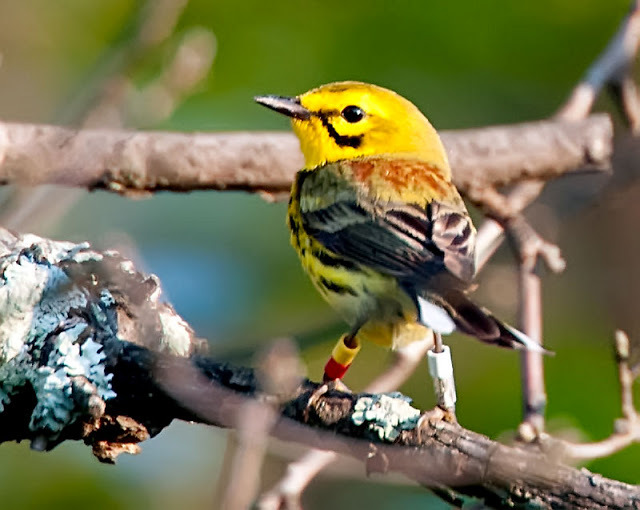 In the IUCN , International Union for Conversation of Nature, the Whip-poor-will is listed as a Species of Least Concern, and yet in the just published Second Atlas of Breeding Birds of Vermont their territorial range has shrunk dramatically compared to the first atlas published in 1985. 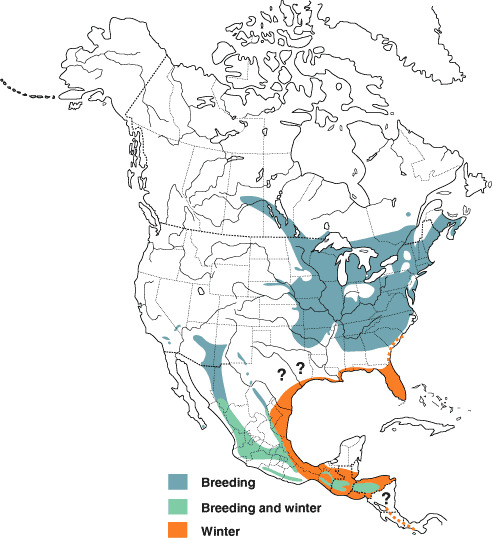 They were once very common and were widely recognized by their characteristic call but having lost habitat to agriculture and suburbanization they are now a Species of Special Concern in Massachusetts, Vermont, New Hampshire, New York and Connecticut. 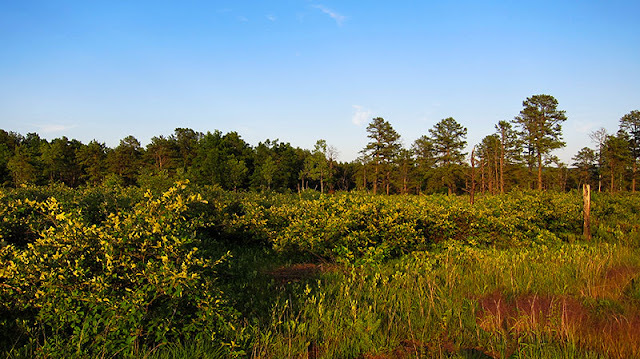 I had arrived at about 7 PM intending, while is was still light, to look for Prairie Warblers, Brown Thrashers and Eastern Towhees which are also common in this kind of habitat, and then wait until dusk for the Whip-poor-wills to appear. 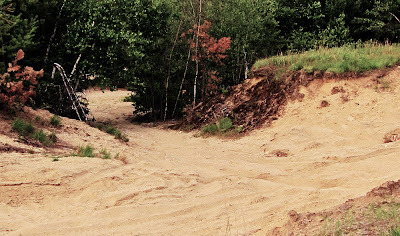 However shortly after my arrival three dirt bikers rolled in and started cavorting on the sand road and in the sand pit that formed one corner of the intersection of Plains Rd and the power-line corridor, their racket drowning out all other sounds. Fortunately they drove off just before 8:30 PM when the Whip-poor-wills started their repetitive calls. The spectrogram below shows a small initial "whip" followed by a brief pause, and ending with a crescendo "poor WILL" Each call lasts about a second and usually goes on for many minutes; one bird was once recorded as making 1000 + calls in a row. The birds iintermittently sally forth from their perches after flying insects, or go after them during continuous aerial feeding flights. 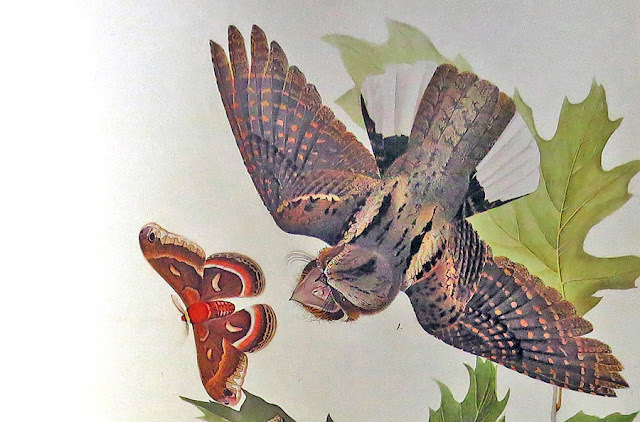 Their beaks are tiny but when open, their gape is enormous, wide enough to swallow a large moth tail-end first, as shown in James Audubon's painting below. I placed a marker near the crossroad of Plains Rd (off Turner's Falls Rd) and a wide corridor with tall pylons carrying high voltage power lines. At the intersection a sandpit is shown in the upper quadrant. 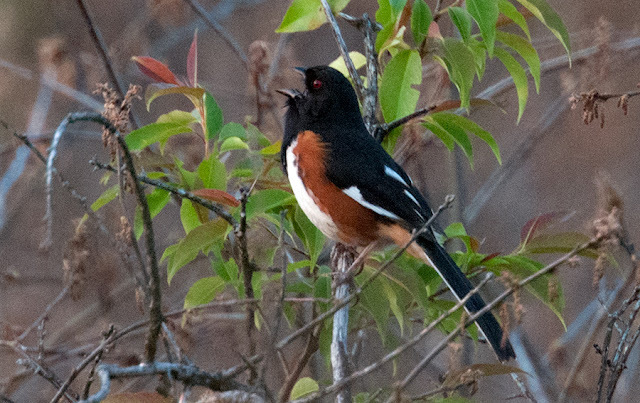 The Whip-poor-will calls were recorded from a bird in left-hand quadrant and Prairie Warblers, as well as Eastern Towhees, were heard in all quadrants. Prairie Warblers and Eastern Towhees in the Northeast are also declining in numbers probably due to loss of habitat brought on by changes in agriculture and by urbanization. Eastern Towhees and Brown Thrashers, all abundant in this area, prefer dense low shrubs, whereas Prairie Warblers prefer successional habitat dominated by small trees and scattered shrubs. Very interesting post. We've recently taken to the dark skies as well over in Tucson and have found the Mexican Whip-poor-wills in great numbers, but more interesting were the once common Buff-collared Nightjars found around Southern Arizona. This year it appears perhaps more than one have returned to our area and what a sound! At one point, right at sunset, we heard Common Poorwills, the Buff-collared Nightjar and Mexican Whip-poor-wills! What an incredible thing to hear flying around us! Thanks for the info! Thanks, Chris. 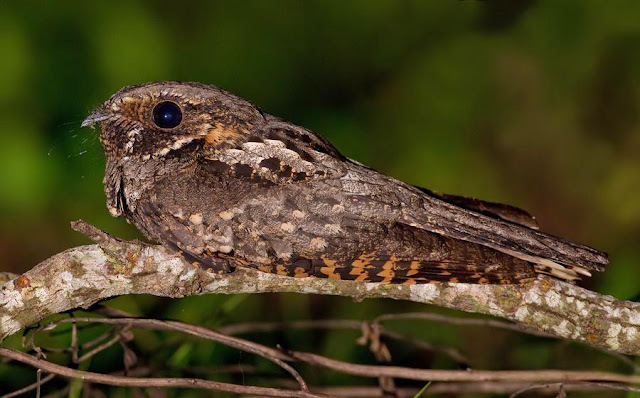 You are so fortunate to have this many nightjars of different species! Thank you for your gracious remarks, Carole! Wow, I lived just a few kilometers from there, back in the '90s, and never new that place existed! Unfortunately, I did not pay much attention to birds in those days, so I missed seeing many species that I would like to have in my records now. However, I distinctly remember hearing w-p-w calls from time to time near my house. Thank you, Michael. I hope my post will lure more people to this unique habitat! Great post, Hilke! I wish the Whip-poor-wills were more common birds. They are very cool! Thank you, Eileen! Yes, they are cool birds, just wished they were more visible. Excellent post, Hilke! I have never seen or heard a Whip-poor-will before until last week. My husband was out working on our country property one evening and thought he heard a Whip-poor-will call. He phoned me so I could listen and confirm the call. Sure enough, it was one of these very elusive birds. Thank you for sharing such interesting information. Terrific photographs too!